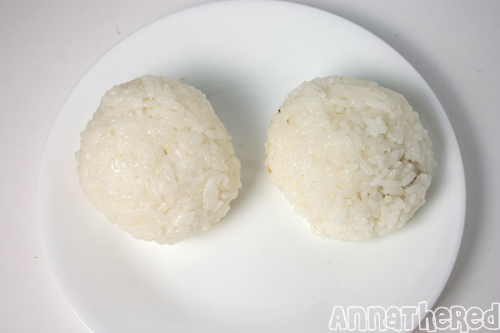 I made this for Totoro parade bento, but I realized that I hadn’t done a how-to on this! 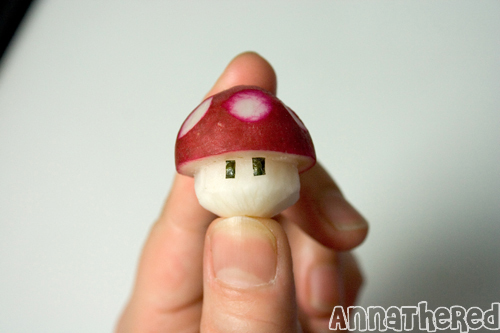 This may look difficult but it’s a very adorable decoration to your kyaraben. 1. 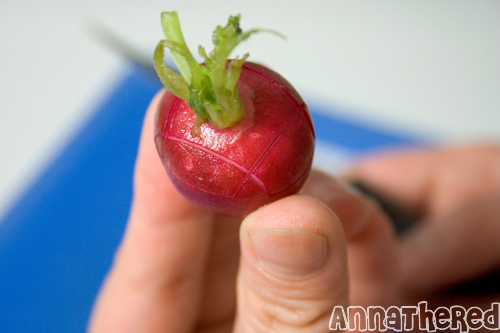 Put a knife in the middle of a radish, and make a small incision. 2-a. 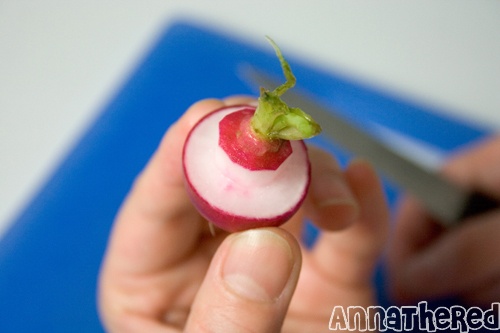 Hold the radish, and spin the radish VERY SLOWLY, and cut all the way around the radish. 2-b. 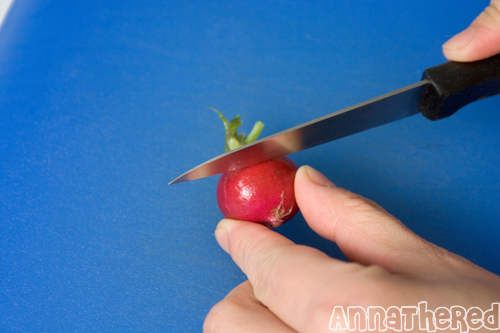 Push the knife forward VERY LIGHTLY, and cut all around the radish. 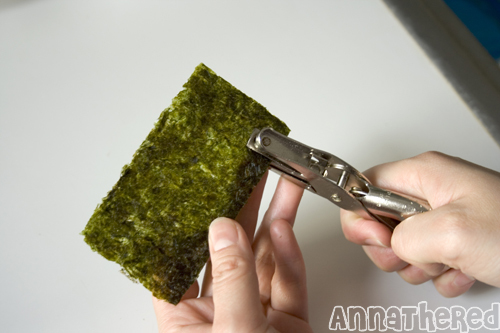 *Don’t push the knife through! 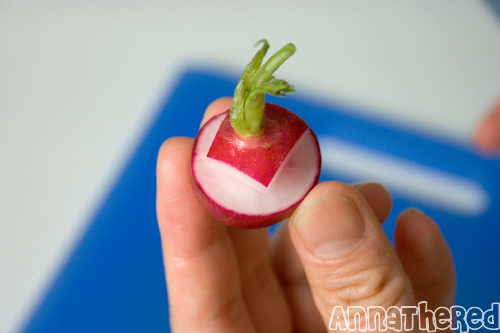 The radish should look like this after cutting all around it. 3. 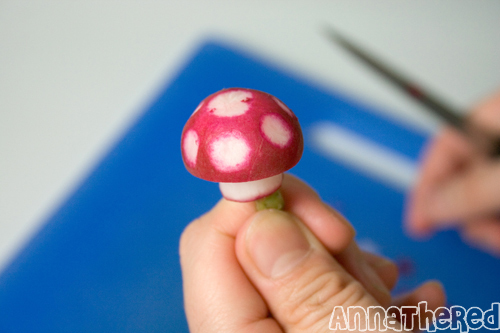 Make four incisions on the bottom side of mushroom like in the pictures. *Don’t cut past the half line! 4. 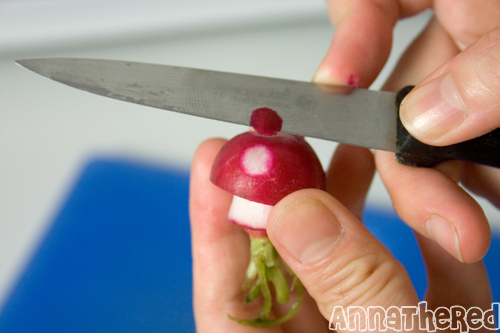 Put the knife on the half line, and remove the radish pieces. 6. 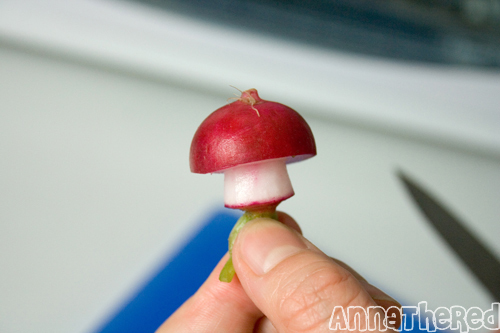 Put a knife on the surface of the radish, and peel the skin. 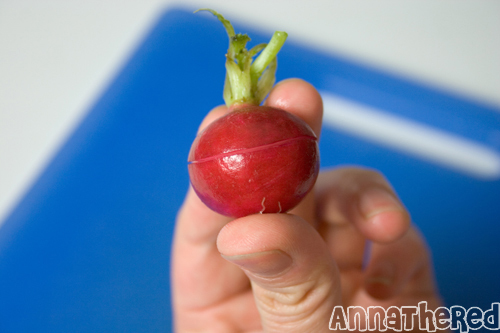 *It’s kind of like peeling an apple, but you don’t rotate the radish, and just peel the skin off. 7. 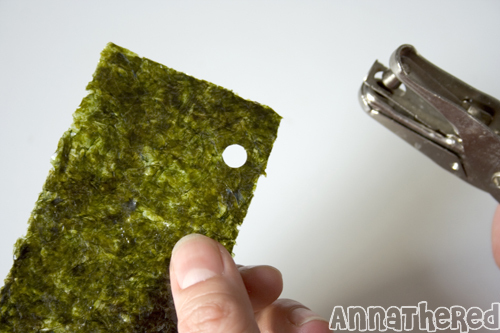 You can make the stem part wider, put a small piece of seaweed and make a Mario Mushroom too. You can just stop at Step 5 if you want. Please be extremely careful with this. I don’t want anyone getting hurt! If you accidentally snap off the stem, don’t worry! You can stick the stem on with a toothpick. 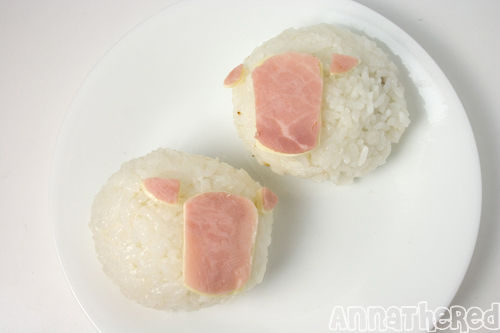 I had to get to work really early today, so no bento blog. 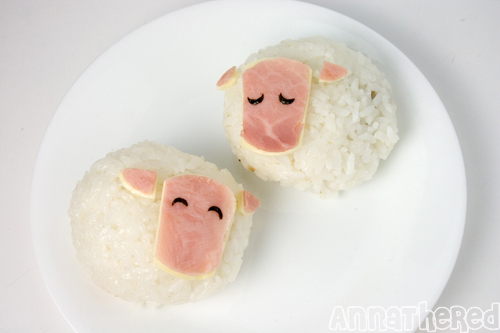 >_< But instead, I’m going to show you how to make bento making less hectic in a busy morning. I’ve done “how to make vegetable flowers” before, but it’s a time consuming process, especially in the morning. 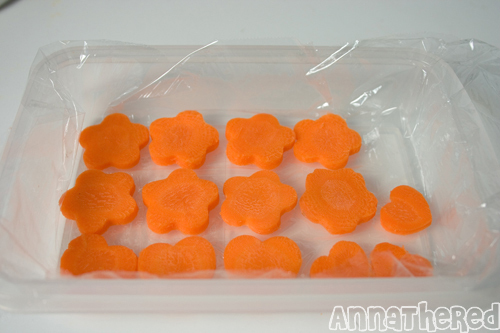 I used to buy baby carrots, because I didn’t have to cut it into a small circle which is a good size for flowers in bento, and they last longer than regular carrots. But baby carrots can be expensive, and I didn’t like the taste of baby carrots. (It tasted… “processed”?) Then I thought I should just buy regular carrots, and prepare it when I have time. 1. 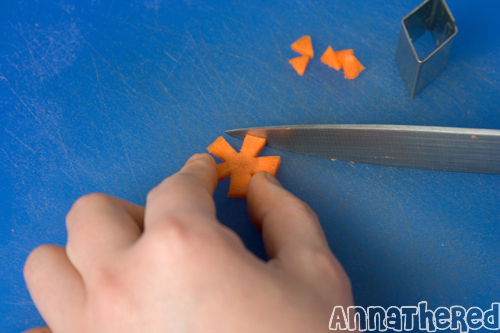 Slice a carrot and make as many as flowers you want. 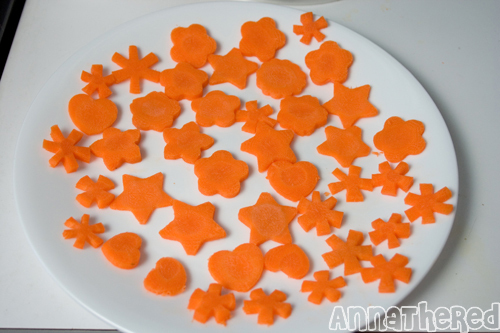 See “how to make vegetable flowers.” I’ve been using a diamond shaped cookie cutter. It makes it so much easier to make flowers. I just trim it to make smaller flowers. This time, I cut out a lot of different kinds of flowers and stars using cutters. 4. Take the carrot flowers out, and dry them really well with a paper towel. 5. 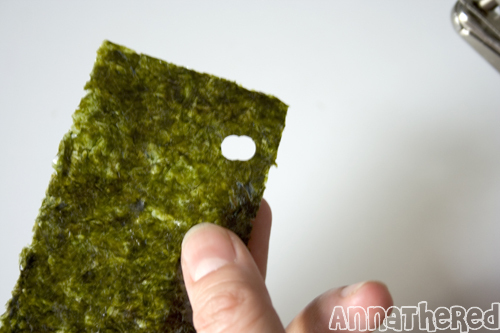 When they’re dry, place them on a plastic sheet. Make sure the flowers aren’t touching each other. 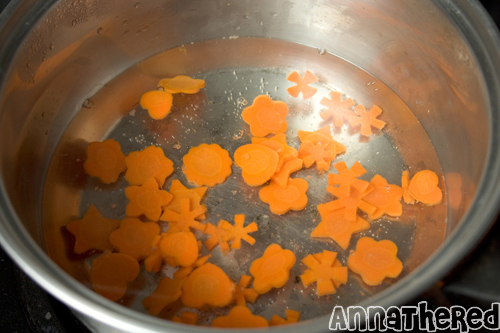 These little cute carrot flowers are now ready to be frozen! 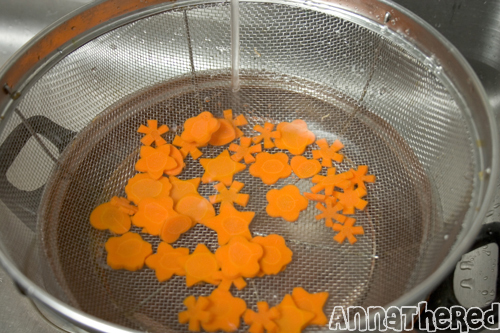 Step 2 & 3 is called “blanching”, and it removes enzymes from carrots, and preserves its color. Of course you can prepare other vegetables in the same way. 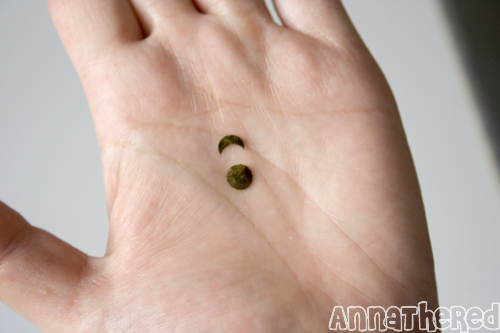 But each vegetable has different “blanching time”, so make sure you check a website like this for a reference. 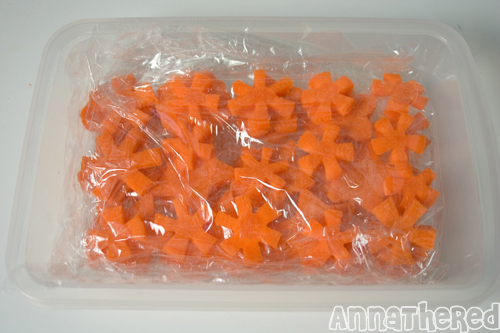 Now you’re ready to sprinkle pretty and nutritious orange flowers to brighten up your bento!